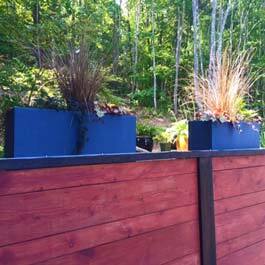 Below are a list of ideas for planting window boxes in the fall. Common themes are pumpkins, yellow and orange displays, red leaves, Halloween decorations, and Thanksgiving decor. Below is just a small sampling of some of the flower boxes that our customers have sent in showing off their fall window boxes. Some great flower choices are maiden grass, perennial sunflowers, boston ivy, virginia creepers, and helenium red and orange, and golden rod yellow, and yellow marigolds. Sweet potato vine is also a classic vine choice that trails wonderfully and is a very durable fall plant that is an easy "go to" if you need to mix in some green trailing vines. 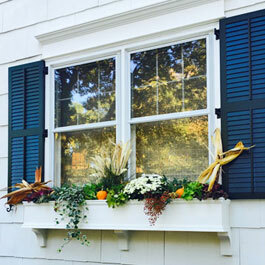 Common window box arrangements for October and November are pumpins, squashes, scarecrows, red foliage, and corn stalks. 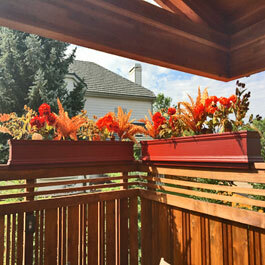 Window boxes can be used perfectly during the holidays to give your home an added touch! 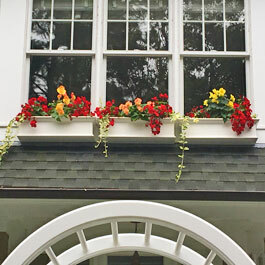 One of the nice advantages to our window boxes is that they can be left out all year round without worrying about cracking, splitting, splintering, warping, bowing, or breaking. This saves you from having to haul and store them away during the fall and winter and opens up the possibilities to plant and decorate them during the most festive parts of the year an show them off to family and friends during these late autumn and winter months.